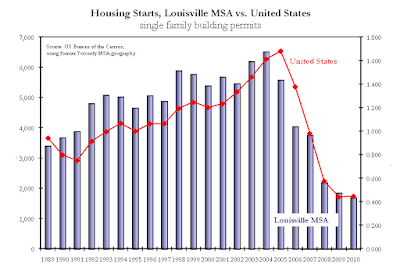 Louisville may not have much of real estate boom, but when it comes to new home construction, local builders have curtailed activity to same degree as the rest of the country. As University of Louisville economist Paul Coomes showed in his budget presentation to the Metro Council on Monday, Louisville-Southern Indiana single-family building permits have plummeted from more than 6,000 in 2004 to less than 2,000 in 2010. Chris Otts covers business topics for The Courier-Journal. Get your local newspaper delivered daily or weekends to your door. Click here for subscription information and special deals. View all posts by Chris Otts → This entry was posted in Uncategorized and tagged Louisville economy, Louisville home building. Bookmark the permalink.